$3,599.99 Seen a lower price? 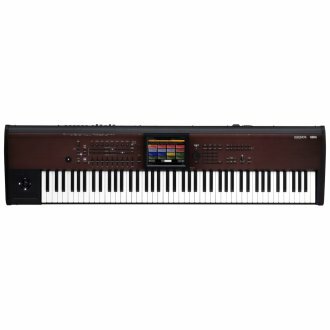 With a newly designed light touch keyboard for effortless playability, the Korg Kronos LS 88-Key Keyboard Workstation lets you take a full-sized keyboard - and the power of Kronos anywhere. Packed with nine versatile sound engines, up to 16 simultaneous effects, 16-part Combinations and so much more, Kronos is Korg's most powerful synthesizer ever. To further unlock Kronos’ potential, Korg introduces a new light-touch 88-key model for a new level of playability - and portability. PCM RAM Capacity: Approx. 2GB: The memory available for Sampling Mode will change based on the use of Expansion PCM libraries and User Sample Banks. - Support for stere-- multisamples, synchronization of individual notes, and tempo-based settings. - Premium Piano: Virtual Memory Technology (VMT) plays large samples directly from the internal SSD Full key stere-- sampling, Chromatically sampled at up t-- 12 velocity levels, n-- looping. Damper resonance and mechanical noise are reproduced. Available until 11 PM (EST) today. Mention special code 1ZR-TRG2 when you call.